Why? Humans aren't faster or stronger than the species we competed with in our early evolution. Chimps are much stronger than we are. Individually, we're largely defenseless against lions and tigers and bears--not to mention rhinos and crocodiles. The idea of one human being or a single family group bringing down a mammoth is laughable. We're smarter, but individually, that only takes us so far. And the more interconnected we are, the more we value and practice fairness, generosity, and justice, not just towards those we know but toward total strangers on the other side of the globe, people whom we'll never meet. Klein lays out the evidence clearly, readably and persuasively. 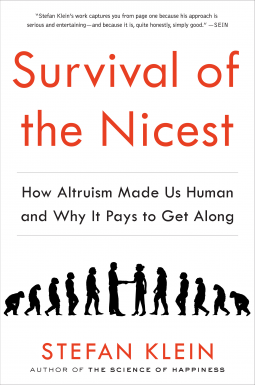 Read this, and you'll feel better about humanity and yourself--and possibly make decisions that make you happier in life, and feel less pressure to do the "smart" thing against your inclination to do the right thing.